A pair of Canadian brothers took a ‘selfie’ with a bald eagle after rescuing the bird from a trap. Brothers Michael and Neil Fletcher, from Ontario, were hunting for grouse in Windy Lake, Onaping when they found the bird of prey caught in a claw trap. Michael told local newspaper The Sudbury Star they were driving through an open area when Neil thought he saw an eagle. After exploring the area on foot, they saw movement and walked toward it, where they found the huge bird on the ground. The eagle had one of its talons stuck in a claw trap, a type of trap used by fur harvesters. He explained how the huge bird calmed down when they covered its head with a hoodie and held on to it while working on the trap’s release mechanism. After the bird was freed, the brothers removed the hood and held it up to take a selfie. Michael filmed Neil hoisting it up to shoulder height and giving it a push. The eagle flapped off into a nearby tree, where it stayed till the men left. 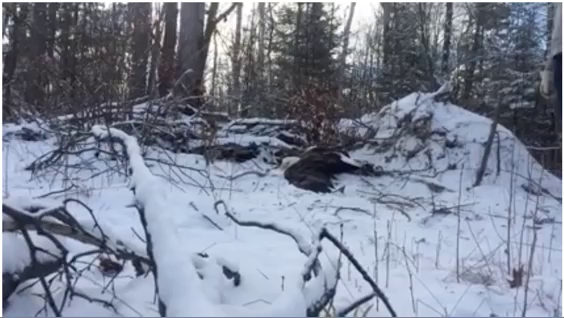 They later contacted the Ministry of Natural Resources and Forestry, who thanked them for freeing the eagle and said they would be contacting the trapper about setting the trap up differently. Back when she was in her 20s, Hazel Ingram was once told that she was “too skinny” for a cleaning job. A man at a hiring agency thought a slight woman like Ms. Ingram wouldn’t be able to handle the lifting involved. His colleague disagreed, saying his hardworking mother-in-law was Ms. Ingram’s size. Ms. Ingram, now 92 years old, has spent the roughly 65 years since then as a cleaner, 60 or so of them at the same Madison Avenue building. And Ms. Ingram, who is employed by real estate and management firm Steinberg & Pokoik, said she has no plans to retire—not because she needs the job but because she loves the work. 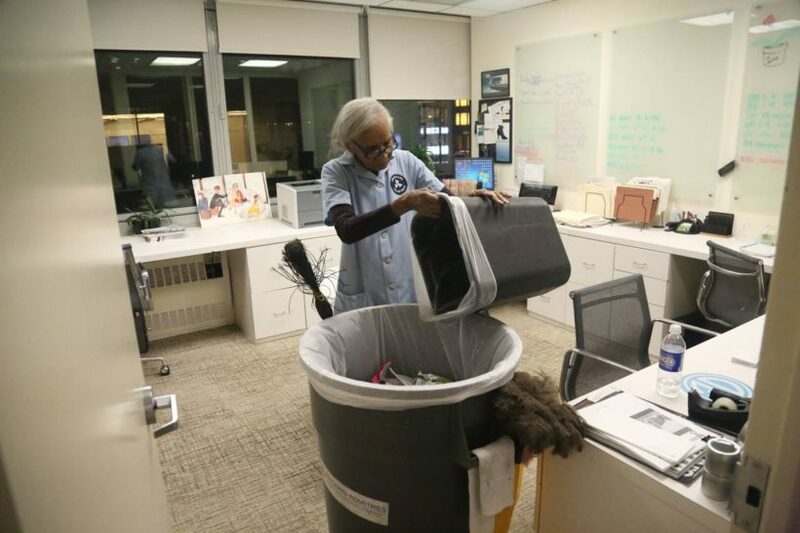 “Even when I was home, I would always clean the house, always, and I never stopped,” Ms. Ingram said before setting off to clean one of the floors she is responsible for at 575 Madison Ave.
Every night starting around 5:30 p.m., Ms. Ingram walks from office to office, emptying wastebaskets into a trash barrel outfitted with plastic bags, a broom, a feather duster. She pulls out the often heavy bags when they are full, dusts desk areas and shelves and, once a week, vacuums both the offices and common areas. Because Ms. Ingram works nights, traveling most days using the Metropolitan Transportation Authority’s Access-A-Ride program for the elderly and disabled, many of the offices she cleans are empty. When workers are there, she sometimes walks in with a singsong hello and is greeted by name or even gets a hug. The friendly exchanges are a big change from decades ago at the building. Another less serious difference over the years is the clutter at workspaces. “They’ve got a little more stuff on their desk than they’re really supposed to have,” she said. And if Ms. Ingram sees a mess, she just might say something. As she collected trash from one real-estate broker’s office during a shift, she reminded him how he used to be messy and left chewed pen caps lying around. She didn’t like it and spoke up. “I’ve been very clean ever since then,” the broker, Richard Hottinger, said with a laugh. Ms. Ingram scoffed when asked if her age makes any part of the job more difficult. But when she was clearly having trouble opening a few ultrathin bags that line wastebaskets, she admitted that can be tough—because of the bags, not her hands. Born in Georgia in 1923, Ms, Ingram grew up in a small town. Ms. Ingram moved to New York City as a young woman, eventually taking a factory job making women’s shoes and, later, also working nights cleaning offices. To mark her six decades at 575 Madison Ave., staff members of Douglas Elliman Real Estate—their offices are cleaned by Ms. Ingram—threw her a party. Ms. Ingram, who was married once and separated from her husband, has four daughters, two sons and 19 grandchildren, plus a small army of great-grandchildren and great-great grandchildren. She worked while raising her children, with a sitter and her eldest daughter helping with child care while she worked. She owns a two-family house in the Brooklyn neighborhood of East New York, where she lives in a converted basement with her brother, Oliver. Her sons, Chester and Rex, live on the upper floors with their families. Ms. Ingram also owns a home in the Poconos. “All of my kids are good cooks and good cleaners, I mean the boys and the daughters,” she said. Vesel Taganovic, the night foreman at 575 Madison Ave., said colleagues were wondering whether Ms. Ingram would retire when he started working at the building—almost 30 years ago.